Each year we’ve come to Colorado, overall participation has grown—from ticket holders to shops and sponsors. This Crawl, our third in Colorado, was a huge success. Ranging from the first espresso bar in the state (The Market at Larimer) to new spaces housing Aviano, Black Eye, Corvus, Commonwealth, Metropolis, and Novo, the Denver Crawl may be our most diverse yet! Denver’s specialty coffee culture is morphing and growing fast (look at all those build-outs! ), and we feel fortunate to be a part of it. Flooding before the Crawl had everyone wondering how the event would be affected; thankfully, we still had close to 85 Crawlers exploring 5 different routes by guided bus, driving, and bike (a combo that will be seen increasingly in Crawls going forward). The LAB’s Kent Baker led our first ever bike route, which started at Rooster & Moon. The other routes began at Roaster sponsor Corvus Coffee Roaster’s new facility. As usual, each shop offered a presentation and samples for Crawlers. Aviano Coffee demonstrated brewing tips, Novo focused on brewing at altitude, Black Eye Coffee compared coffee flavor profiles, Metropolis Coffee explored coffee routines and rituals, and Fluid Coffee Bar went over cold brews--including batches from Denver Crawl sponsor Toddy. The Market, Rooster and Moon, and The Denver Bicycle Café incorporated a sweet side to their focus. The Market demonstrated a coffee and cake pairing using Crawl sponsor Allegro’s not-yet-released Celebration Caffé, while Denver Bicycle Café had a single origin hot chocolate tasting with Good Drinks leading the presentation, and Rooster & Moon focused on creating housemade syrups for signature coffee drinks. Corvus and Commonwealth covered the roasting and sourcing processes, with Commonwealth focusing on quality control, and Corvus addressing the steps of managing coffee. In a fun twist for attendees, event packets were full of swag worth more than the price of the ticket! Our sponsors, Allegro and Corvus, showed their generosity by both supplying each Crawler with a bag of coffee. Everyone received a Rip Van Wafel, a current Barista Magazine, a Wholesome Sweetener variety pack, a Denver Bicycle sticker with a bike repair discount, a custom paper sleeve from Sleeve A Message and a cloth one from Allegro with a logoed cup, an event program, and a Denver Crawl souvenir bookmark and sticker. Besides area sponsors like Allegro, Corvus, and Koffee Kompanions being able to attend and participate, we also had Brian and Anastasia from Unic and Barista Nation fly in to be a part of the event. They weren’t the only ones who made the journey--we had a group who came from Wyoming and South Dakota! After the actual Caffeine Crawl we had our raffle for Adaptive Adventures and the Latte Art Throwdown where a dozen coffee lovers competed on Unic's Stella di Caffe espresso machine. The top raffle prize was a Vario-W from sponsor Baratza followed by ten other great raffle prizes (all raising money for Adaptive Adventures). More fun continued with a free-pour Throwdown for fun...and of course, prize money. Local craft beers from Avery and Breckenridge, and some friendly smack talk added to the camaraderie. Judges from Allegro, Corvus, and Unic crowned Miguel from Metropolis the winner. 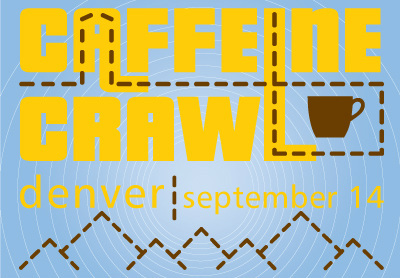 After such a great Crawl, we can’t wait for next year, when Caffeine Crawl will visit Boulder and Fort Collins!